It's been already three weeks since our last article, so it's time for a new issue of The Funding Crowd, the 47th! After Palladium comes Silver, a rarer metal but also much much more valuable. That's why, even though the amount of picks have dwindled a bit this time around, we hope you agree they are at least of top-notch quality. So dear reader please don't act as a Kalashnikov and, instead of shooting your way through this issue, prepare to slowly savour the treats we've selected for your crowdfunding pleasure. I admit that I missed out on the Myst phenomenon back in 1993, perhaps due to not owning a Mac. However, even the 2000 remake for PC passed me by, despite having owned my first PC for five years by that point. What apparently made Myst special was (for the time) the incredible pre-rendered graphics, surreal atmosphere, intelligent, intriguing puzzles and a story that made you care about its multiple endings. In terms of spiritual successors to this well loved series, the best is probably The Room series by FireProof Games. However, that may be about to change with Quern: Undying Thoughts. Unlike The Room and its sequel, Quern is a first-person exploration game set on a mysterious island. Unlike Myst, however, it is a true first person game, using an FPS mechanic and does away with its inspiration's "cross fades". According to video game logic, maybe not everything that glows is gold but it surely must be relevant to the game plot somehow. So, drawing on Myst and author Jules Verns' books, Quern hopes to create a mystical, engaging atmosphere to draw the explorer into the world and discover its mysteries. A mechanic reminiscent of The Talos Principle, many of the puzzles you complete might later interact with future puzzles to open additional areas, secrets or story. Indeed, Zadbox Entertainment are hoping to do away with the overused concept of "find key, open gate, repeat" and instead prefer to draw on the Metroid mechanic of having later discovered items used in unusual ways to open previously inaccessible areas. The small team are using Unity 5 as their engine, but this is probably the most beautiful Unity 5 game so far promised. The small target of £20k is due to the near completion of the game: it's due in about a year from now. The money is to cover some small operating expenses incurred over the past year's development, finish the remaining 50% of the storyline and finally complete the voice narrative to a sufficiently high standard. The game is currently around 6 hours long, but will be nearly double that length once ready. A pledge of £10 will secure you the game. Steamroll is an isometric puzzle adventure game, with elements of strategy and minigolf games. It is being developed using Unreal Engine 4, and has a striking, realistic steampunk look. The game is far enough along in production that it is at a playable stage, but needs additional funding to be completed and expanded before its planned release later this year. 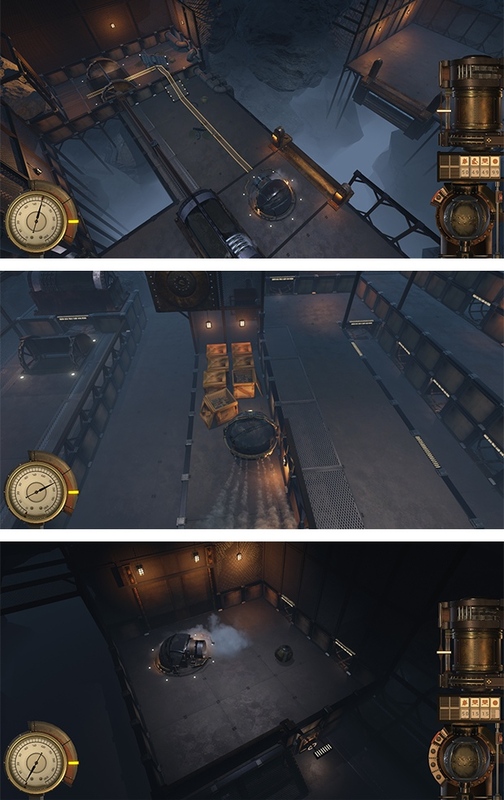 In Steamroll you control a steam powered, rolling vehicle called the Scarabeus, and have to traverse some kind of indoors facility. Along the way you encounter several obstacles, like ledges, debris and closed doors that you have to deal with, and here's where strategy and the surprising element of minigolf games is at play. Around each level, you'll find docks that the Scarabeus can be deployed in, and when it is, you'll be able to launch smaller steam balls that have unique, configurable abilities. You shoot the steam balls, using trajectory prediction lines to guide them to their desired location, and when they're triggered, either by impact, manually or with a timer, their use come into effect. Want to get rid of some debris? Use a bomb. Need to get up a ledge or get your next ball around a bend? Use a ball that turns into a ramp or an angled wall. The developers are aiming for a total of 12,000€, and have already raised over 3,000€ in pledges with three weeks left of the campaign. Steamroll is also on Steam Greenlight, where it was greenlit in just a week, so it will be on Steam, but also on DRM-free stores, like GOG.com. To acquire a copy of the game on completion, you only need to pledge 7€ to the project. And if you want some digital goodies, the 18€ tier comes with the soundtrack and a digital art book. Never Ending Night is an exploration platformer with a dim and minimalistic art style reminiscent of that of LIMBO and Monochroma. In the main mode, you delve into a story of relationships and self-exploration, inspired by the developers' own sufferings of broken hearts. The Expedition Mode, which is available as a higher tier add-on, is more focused on combat, takes place in a procedurally generated world, and is intended as a natural extension to flesh out the game world. The game puts you in control of Cain, who sets out to put and end to the never ending night in the land of Zarek. You have a mechanical butterfly sidekick, named MLBY, who aids you on your journey, to illuminate this dark and eerie world. The focus is on action and story, but with some light environmental puzzles to make your way through the darkness. "Thanks for the tip bro, but after seeing THAT, I was gonna run no matter what you said..."
The modest $2,000 goal has been passed more than twice over, and the developers are now aiming for the stretch goals. Unlike most other campaign creators, these developers intend to add additional features and content based not on money pledged but on number of backers. If they can get 100 supporters on board, they will add the soundtrack to all Expedition Mode backers at $15 and up. They also have mobile version and free DLC goals at 150 and 200 backers respectively. If you just want a digital copy of the story mode on Steam, you'll get that by pledging $7 or more. We just couldn't end a list of Hidden Gems without recommending a pixel art game, so here comes The Aquatic Adventure of the Last Human to fill the unwritten pixely quota. And creators Y/CJ/Y do really take their pixel art seriously, as you can attest if you've watched their pitch video. Taking the form of a metroidvania action adventure The Aquatic Adventure of the Last Human will put you in the shoes of the last human being alive, who returns to Earth from a failed space mission only to find it completely flooded and the human race long ago extinct. Considering this apocalyptic submarine setting it's no wonder that two of the main inspirations for this game are Planet of the Apes and 20000 Leagues Under the Sea, but so is The Life Aquatic with Steve Zissou and with it comes the ecological themes: climate change and the degree of humanity's responsibility for it. Gameplay-wise, and true to the metroidvania spirit, entire new areas will open to exploration as the player unlocks up to 10 upgrades for the spaceship/submarine Argo 9. Add some epic boss battles to the mix, and you'll get a splendid blend of action, exploration, and mystery as you unravel the fateful demise of the human race. And all of this with the accompaniment of some synth rhythms perfectly toned to the mood of each area and moment (although we must confess we're somewhat disappointed for the absolute lack of accoustic David Bowie covers in Portuguese). Jokes aside, and all things considered, The Aquatic Adventure of the Last Human is the kind of thing that mustn't be let to fail. All the more so when a Linux version will only happen if the campaign gets fully funded. And with less than 3 days to go before the deadline, there's still almost kr10,000SEK missing. That's about £800/$1,200/1,100€, so raising that amount totally falls into the realm of possibility. And considering the entry barrier is lower than $10 (including a DRM-free copy of the game, a wallpaper pack, and your name in the credits) there's no excuse not to throw your money at Y/CJ/Y so they can turn it into pixely metroidvania goodness! Please follow us to the next page to discover our new Biggies, as well as the fates of our former picks! Good catch! Certainly, it's almost onto £2M, which is actually $3M! Quote If we come up short of this $130,000 stretch goal, perhaps no one will know about them and the world will be swallowed up in Darkness! leillo1975 What's your opinion about this? Are they even an indie company? Weren't they sponsored by Sony at E3? So instead of Sony funding it, here ya go, free money? As for the opinion on it, well it's kickstarter. We've had failures and successes. This one doesn't outright exclude Linux, but we know it will because the fine print will obviously mislead some people's hopes. Again, it reeks of a Sony advertisement more than anything. Quern looks great and I'd love to play a new Myst-like game, but I'm not sure I'm confident enough given I don't really know anything about the developers. It's certainly something I'd buy if it released and got positive reviews, though. 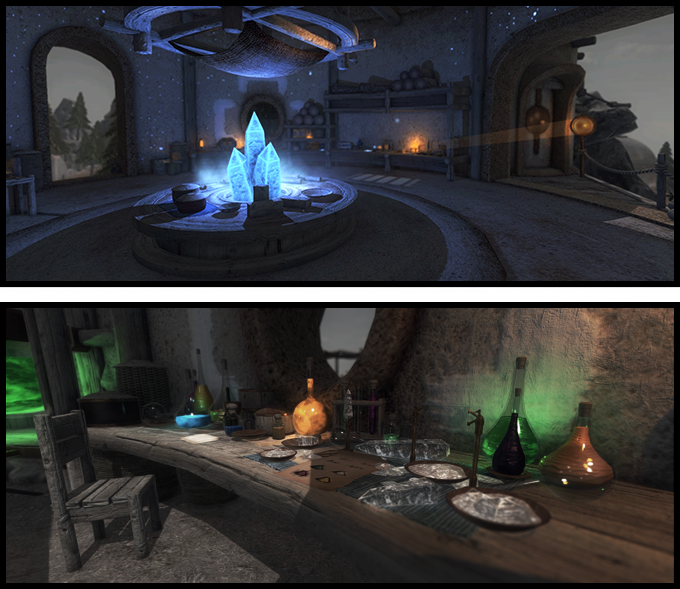 Keyrock Quern looks great and I'd love to play a new Myst-like game, but I'm not sure I'm confident enough given I don't really know anything about the developers. It's certainly something I'd buy if it released and got positive reviews, though. Check out the video - the pedigree is obvious and they're already around 50% complete. I don't think there's huge risk involved in this one, but your mileage may vary! Quote Currently we are planning development only for PC (Windows) and PS4. Other platforms have not been decided yet. Yeah, I'm also very skeptical when Linux is mentioned almost as an aside. Doesn't give me a ton of faith in the developer's motivation in supporting our platform. Ys Net PC version will support Windows. Everything else is currently under consideration. Any further news on this will be announced on the Updates page! So anyone interested, keep visiting the updates page for any news regarding a Linux version. I wouldn't be very optimistic though.